The effectiveness of blue-light therapy for human skin is assessed in vivo using Raman spectroscopic biomarkers. Dr. Nihal DeSilva and Dr. Simon Yu, Prevention & Healing Inc. The goal of preventive medicine is to stop illness before it begins, or to discover and treat disease before it spreads and becomes serious. There are many approaches to preventive medicine today, including screening for high blood pressure and diabetes, prescribing drugs to lower cholesterol and recommending lifestyle changes, such as exercise and a balanced diet. However, the fundamental understanding of health and disease is dependent not so much upon genetic factors but more on epigenetic changes that are reversible. These play a unique role in holistic medicine.1 It has been said that epigenetic changes may be the root cause of disorders such as cancer, cardiovascular disease, diabetes and more, and alternate therapies are being sought to address these. Color therapy can induce subtle yet dramatically beneficial health effects in humans.2,3 In this study, color therapy using blue light was used on subjects with a previous history of health conditions that had been monitored by Raman vibrational spectroscopy.4 Our preliminary results indicate that blue light significantly affected the skin meridian vibrational Raman spectral shifts, indicating that the Raman technique with the attached fiber optic laser system is ideal for studies of this nature. This report is the first investigation of in vivo acupuncture meridian systems of the human skin using Raman spectroscopy. Color therapy was administered on the patient by the Mora Color instrument from Med-Tronik of Friesenheim, Germany. Blue light was applied to the left hand as the subject held onto the color transfer probe for two minutes. Immediately following this therapy, the right-hand finger meridian points (minimum of three) of the subject were monitored by Raman spectroscopy. Briefly, the Raman system used in this study consisted of a ProRaman-L B-785 high-performance Raman analyzer from Enwave Optronics of Irvine, Calif. It was equipped with a 785-nm frequency-stabilized, narrow-line diode laser and fitted with a high-sensitivity CCD spectrograph cooled up to –60 °C. The spectral range was between 250 and 3000 cm–1. Initially, the skin meridian points on both hands were imaged using a 20x lens attached to the fiber optic probe, providing the background information before the color therapy. The possibility of spectral artifacts caused by changes in pressure on, and angle of contact with, the subject’s skin was considered in the collection of data. Before real-time measurements were taken, two consecutive random scans with a mild, moderate or firm probe measured skin tissue pressure with a 10-second recovery period, with the probe lifted from the tissue surface between measurements. From these determinations, mild pressure scans were deemed suitable for obtaining optimum in vivo scan results for this study. Detailed principal component analysis of spectra (for a larger subject-based study) will be considered later to determine whether any systematic or significant differences exist due to probe pressure or angle.6 In this study, three consecutive scans were taken for each meridian point, and the mean intensity did not differ more than ±3 percent. 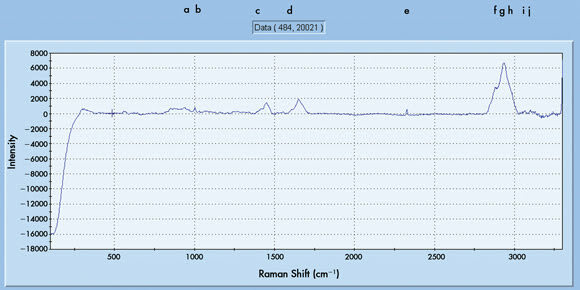 Representative Raman spectra of Subject 1 (R.S. ): Figure 1a shows representative spectra of precolor therapy of the subject’s right meridian points, while Figure 1b shows the corresponding spectra of postcolor therapy. Similar scans were recorded for other subjects (data not shown). The spectral shifts can be divided into two main regions, such as the mid-frequency fingerprint region and the high-frequency region. Figure 1. (a) Raman scan of skin monitored in vivo before color therapy (major Raman shifts are labeled from a to h). While specifically considering the mid-frequency region, the following shifts (cm–1) were observed: 557, 871, 1000, 1072, 1343, 1443, 1557, 1614 and 1657. However, the major shifts in relation to blue-light therapy were confined mainly to 1443 and 1657 in this fingerprint region. These spectral shifts are assigned mainly to skin proteins, sugars and some lipids. For example, the 800-cm–1 region may represent C-H deformation due to beta linkages in proteins; similarly, the 1000-cm–1 shift region may represent the C-O and C-C stretch vibrations.7,8 The 1300- to 1550-cm–1 region may represent amide III vibrations, COO- stretch, CH3 bend and CH2/CH3 vibrations derived from skin lipids and collagen II. Finally, the 1600- to 1700-cm–1 region may indicate the amide I vibrations due mostly to skin collagen III. Figure 1. (b) Raman scan of skin monitored in vivo after color therapy (major Raman shifts are labeled from a’ to h’). The current results show that these ratios change with blue-light color therapy. The overall augmentation of blue-light therapy on skin meridian Raman shifts is denoted by ratio ABL:BBL, or after blue light to before blue light, as indicated in Table 1. The Raman shifts attributed to the region between 1400 and 1600 cm–1 showed nearly a twofold increment compared with the region between 2800 and 2950 cm–1. This may indicate that the effect of blue light is more pronounced on Raman vibrations due to protein structural components such as the amide III, C-O and C-C, and due to lipidic structures (ceramides, phospholipids) such as COO-, CH3 and CH2 vibrations.9 As indicated in Table 1, the high-frequency (2800 to 2950) Raman spectral augmentation by blue light is more than one order of magnitude compared with the control. Similarly, the ratio m is low, as the Raman vibrational shift at 2833 cm–1 before color therapy is of low intensity (0.42 to 0.46, Table 1). However, with blue light, the increase in intensity of this vibrational shift is evident (Figure 1b). This indicates that the m value does not change a great deal with the blue-light therapy in this subject. Table 1. Comparison of Raman vibrational shifts monitored in vivo before and after blue-light color therapy (Raman shifts with notations such as a, b, e and so on were omitted when they did not show a significant change in intensity). However, the n values did change with blue-light therapy, the ratio being about 1.92 before the color therapy compared with 1.76 after. This data taken together means that the same lateral chain-chain ordering, but with a different intrachain structure, may take place with a different degree of perturbation at varying depths of the skin cell bilayer for this particular meridian point in this subject. Whether this would mean a dampening effect of overcoming adverse conditions by blue light on skin cellular pathways needs further work. We are continuing this work with more subjects so that we can continue to use Raman spectral biomarkers to understand blue-light color therapy. 1. Blue-light therapy has a definite augmentation effect on the relative intensity of Raman vibrational spectral shifts as investigated in vivo on the thumb skin of a human subject. 2. The augmentation effect was elevated by a 2.5-fold increase in the low-frequency Raman shifts compared with a nearly 1.4-fold increase in the high-frequency region. Minor changes in lipidic molecular chain-chain interactions and order-disorder perturbations were also evident. 3. The data indicates that the effect of blue light is more pronounced on certain specific Raman shifts due to protein and lipidic biomolecular structures in the skin. Further work is being pursued to decipher the exact physiological effects of blue light on the skin meridians in health and disease. Dr. Nihal DeSilva and Dr. Simon Yu work at Prevention & Healing Inc. in St. Louis; e-mail: biodoc65@gmail.com. 1. S. Yu (2010). Accidental Cure. 2. D.C. Holzman (January 2010). What’s in a color? The unique human health effects of blue light. Environ Health Perspect, A22-A27. 3. L. Marshall (April 2010). Mouse model shines light on locomotor circuits. Biophotonics, p. 8. 4. P. Lasch and J. Kneipp, eds. (2008). Biomedical Vibrational Spectroscopy. Wiley-Interscience. 5. X. Nan et al (August 2004). CARS microscopy lights up lipids in living cells. 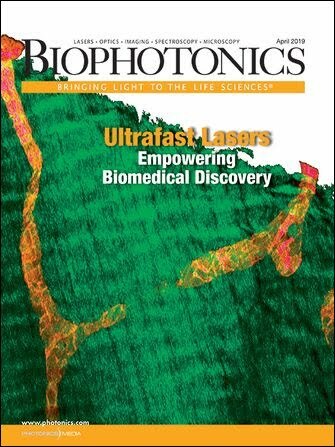 Biophotonics Int., p. 44. 6. M.G. Shim et al (July 2000). In vivo near-infrared Raman spectroscopy: demonstration of feasibility during clinical gastrointestinal endoscopy. Photochem Photobiol, pp. 146-150. 7. N.S. DeSilva (September 1999). Structural changes in the lipoprotein complex of bronchoalveolar lavage (BAL) fluid detected by Raman spectroscopy. Spectros Int J, pp. 21-24. 8. N.S. DeSilva et al (June Suppl. 2004). Identifying macromolecules: The authors review a surface enhanced laser Raman spectroscopy study of lung surfactant protein interaction with bacterial lipopolysaccharide. Spectros Int J, pp. 48-52. 9. G. Zhang et al (2008). Interplay of univariate and multivariate analysis in vibrational microscopic imaging of mineralized tissue and skin, In: P. Lasch and J. Kneipp, eds. Biomed Vibrat Spectros, Wiley Interscience, pp. 357-378. A flexible single- or multifiber cable having a bundle of glass fibers arranged to transmit an image.